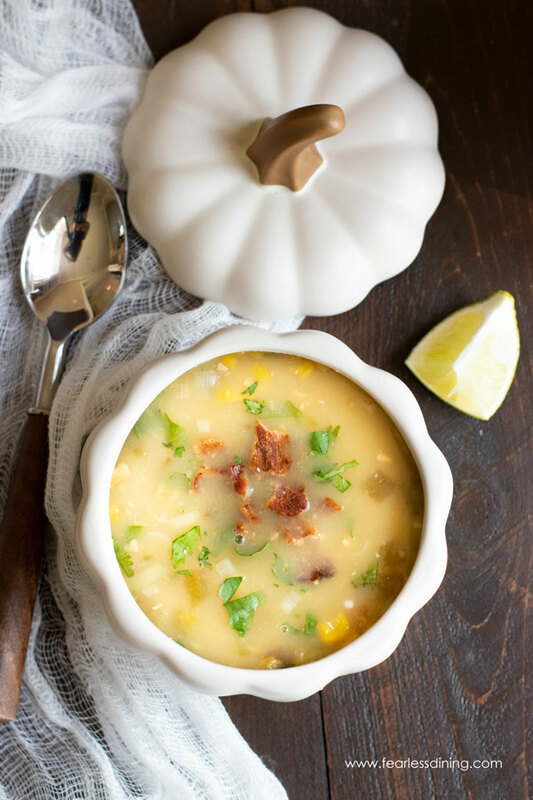 The flavors of creamy corn chowder, with a hint of spice from roasted green chiles, combine to make a deliciously easy fall soup. 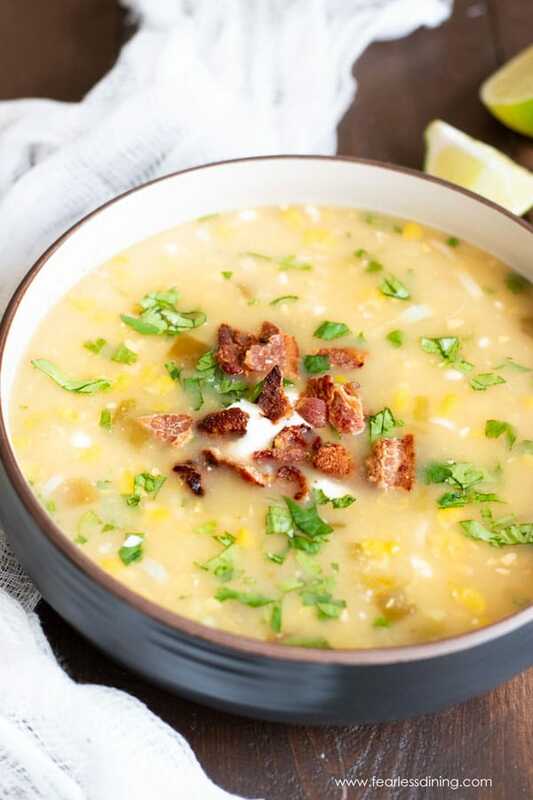 This Canned Corn Chowder recipe is ready in under 20 minutes, making it perfect for any time! I am so excited that Thanksgiving is around the corner. Time flies by so quickly, even though it can be harder to tell here in the Bay Area. We don’t get all of the beautiful vivid fall foliage here, but the cooler days are a sure sign! Today you are in for a special treat because I am sharing my grandmother’s secret Corn Chowder with Creamed Corn recipe. In the old days, she made her corn chowder from canned cream of corn. 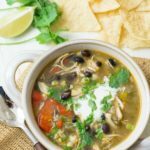 I am not sure if it was the convenience or if that is just what she just had on-hand…but I will always remember this soup as our family’s’ comfort food. 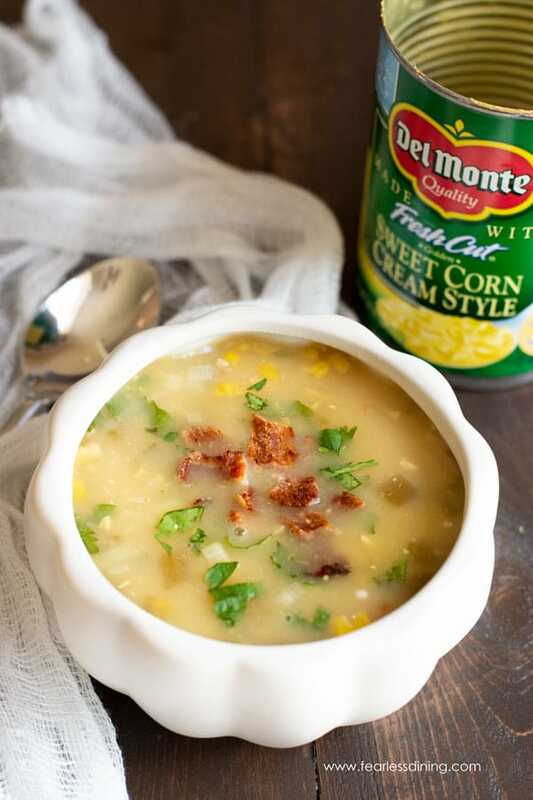 Del Monte® Fresh Cut® Golden Sweet Corn Cream Style helps me bring her recipe to life. 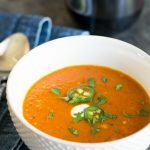 I did jazz up her recipe a little bit because if you have been following my blog for a little while, you know I love spice. Do you have a family recipe that brings back memories? This soup does it every time for me. 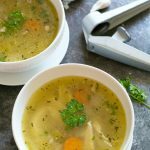 When making this soup, quality matters. 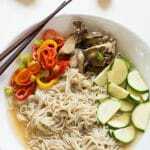 I love to use Del Monte Fresh Cut Golden Sweet Corn Cream Style. It ensures the perfect soup every time. The corn is picked at the peak of freshness. Del Monte grows with family farms; many of these farms have grown for Del Monte for generations, and they preserve the wholesome goodness you’d expect from your own backyard garden. 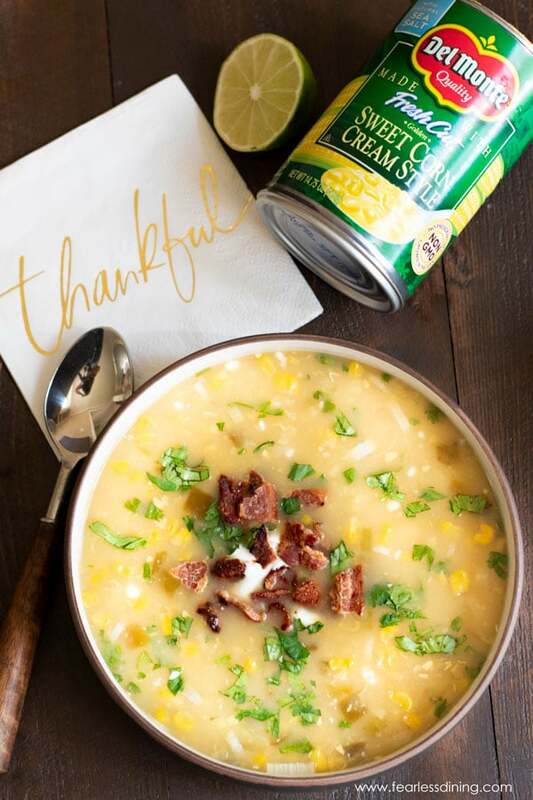 This year, we are serving grandma’s corn chowder as the first course at our Thanksgiving dinner. What better way to remember her than through her recipes? 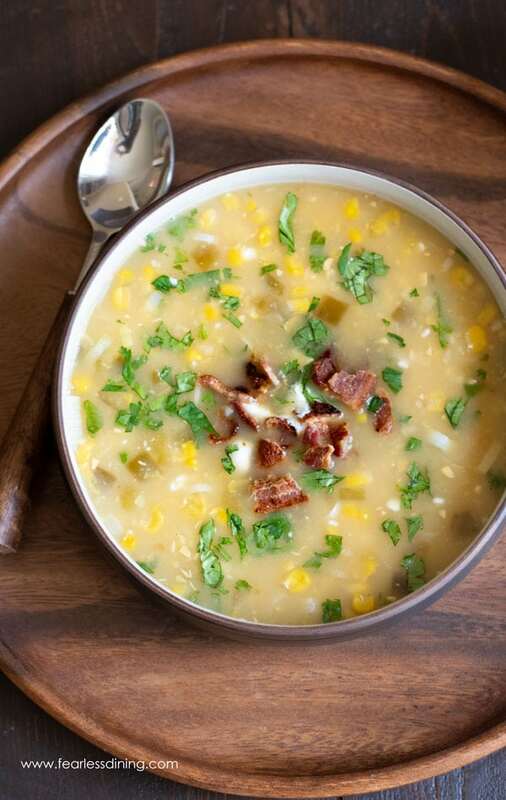 This canned corn chowder recipe is so easy and convenient to make. 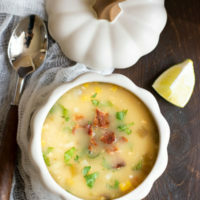 Are you ready to see how easy this canned cream corn soup is to make? Add tapioca starch, then reduce to a simmer for another 10 minutes. 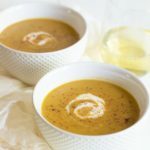 The soup will become thick and delicious in no time! 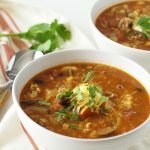 Pour the soup into bowls and garnish with a dollop of sour cream, crumbled bacon, and fresh chopped cilantro. View more Del Monte holiday recipes here. The first step is to sauté the leeks and garlic in olive oil over medium heat. 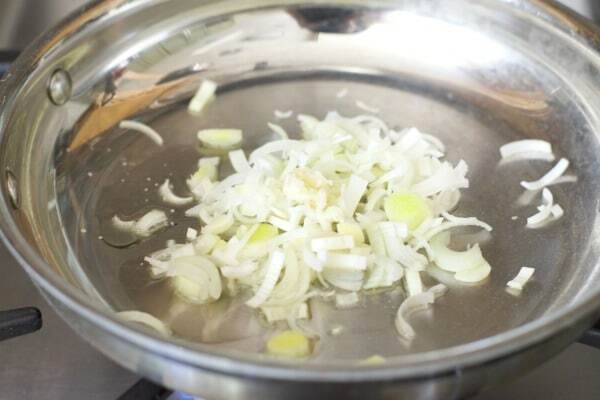 cook for 3 minutes until the leeks are softened. Add the corn chowder ingredients into a soup pot. Stir in the leeks and garlic. Stir to mix it all together and bring to a boil. 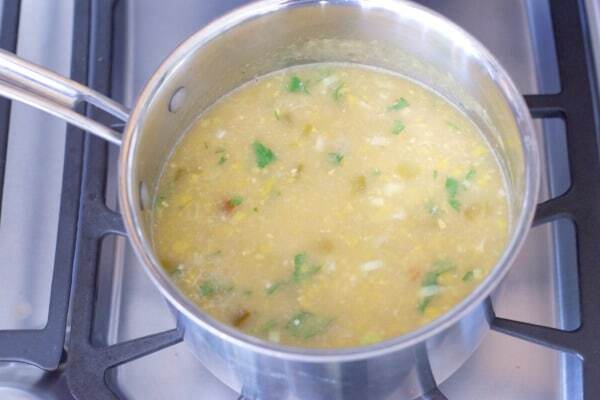 An easy creamy corn chowder recipe with roasted green chiles. In a soup pot, heat olive oil on medium heat. Add leeks and garlic. Sauté for 3 minutes. Add corn and the rest of the ingredients (except the cheese). 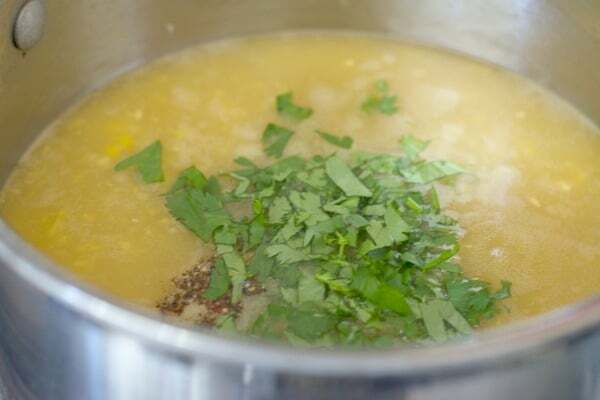 Cover and bring the soup to a boil, then reduce the heat and simmer for an additional 15 minutes. Add the cheese and allow to simmer and melt in for 5 minutes. Serve warm with a sour cream, bacon, and cilantro garnish.